Sculptural paperweights were typical novelty items. Cheaply made, in pressed glass, they were widely available. After a joint venture with his two brothers, John Derbyshire established his own factory for pressed glass in Manchester in 1873. Under the name of John Derbyshire & Co., the Regent Road Flint Glass Works, it operated for only four years. 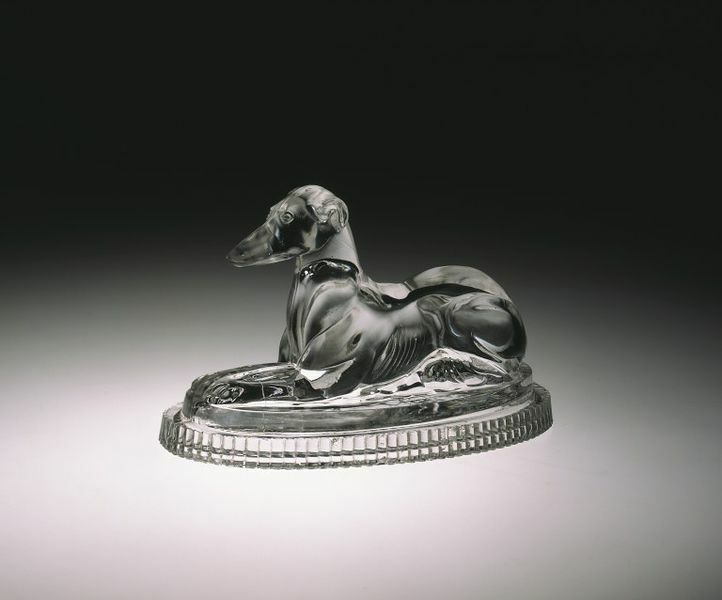 John Derbyshire registered the design of this paperweight in 1874. Glass Paperweight, England (Manchester), made by John Derbyshire, Regent Road Flint Glass Works, 1874-1900, C.135-1983 . 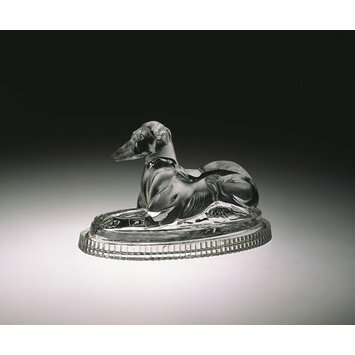 Thompson (1989;41) called a jar cover as well, according to Lattimore (1979;p.94) the greyhound is based on work by Landseer.